In September of 2016, I had just joined the board of the Greater LA chapter of the American Foundation of Suicide Prevention and received a scholarship from the national office to attend their first ever conference for long-term survivors of suicide loss. My experience there was a triumphant and validating culmination of a year of personal growth, purpose, and engagement with the world that started when I first shared my story with another survivor at the group’s Santa Monica Out of the Darkness walk the year before. My mother killed herself in 1985, and suddenly talking about it to other loss survivors allowed me to process much and heal by leaps and bounds. I became very comfortable talking about both my story and the subject of suicide. 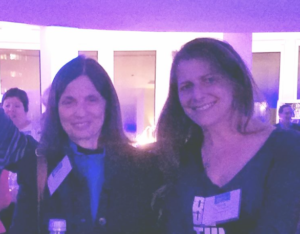 Meeting other long-term survivors at the conference, however, brought a whole other layer of relief I didn’t expect. Long-term survivors have distance from the trauma and have either dealt with their grief, or are practiced at working around it. We can laugh about some things that recent survivors might take offense at. We can reflect on how we felt early on without the grief overtaking us for the rest of the day. We have conversations that come from experience, scarring, and time. Our grief is still deep, but it has shifted and our perspectives are different. We survivors are all family, but among the many cousins, those who have similar distance from a loss feel like the ones we grew up with. At the conference, one of the break-out sessions I attended was a writing seminar given by Carla Fine, author of No Time To Say Goodbye. Her book, released in 1999, was one of the first to discuss grief after suicide. She wrote it because when she searched for something to read about what she was experiencing after losing her husband to suicide, she found nothing. Now in it’s 23rd printing, the book continues to be a valuable resource for those affected by suicide. Through her work, Carla has become a prominent figure in the mental health/suicide world. She has continued to write about suicide loss and other subjects, and travels the world speaking to survivor groups and professional organizations while continuing to write. The exercise she gave us was to just put pen to paper and write whatever came into our head for five minutes. Thoughts did just flow and I ended up writing about a teddy bear in storage and how taking it out would mean I feel I’m the person I’m meant to be – if I remember it correctly. And, yes, the bear is still in storage. Going against my natural tendencies, I raised my hand when she asked who would like to share. I was somewhere in the middle of about 8 people who read aloud. I remember being very impressed with all the stories and the wide range of topics and styles. I felt mine was a bit more rambling and not a good example of my skills, but I felt compelled to put my hand up, so I read mine. I honestly don’t remember what anyone, including Carla, said about it in the room, but it couldn’t have been bad because I would have ruminated on that for a long time, and it would have missed the point of supporting each other at the conference. I am hoping The Silent Goldens documentary will open the type of doors that Carla’s book did for her – to be able to take my story around the world to inform professionals about suicide loss and encourage survivors everywhere to be open with their stories and to address their pain. Carla sharing her story as a speaker at the event connected deeply with me and made me want to attend her break-out session. I felt unusually compelled to share my writing and Carla connected with that, solidifying my confidence to move forward with my project. The confluence of events was on the magical side. Carla and I have stayed in touch and I’ve visited her a couple of times when I’ve been in NY. She’s been very supportive of my documentary project and I’m so grateful she spoke to me for this new Talk About Suicide With Carla Fine. Be sure to subscribe to our channel! https://www.youtube.com/channel/UCOmPFumUvgHp-ZE-06DOYig? Please share with as many people as possible – you may not know you know someone who it could help. Filming Has Begun and Shoot 1 is Done! © 2019 The Silent Goldens. All Rights Reserved.